GPAW development can be done by anyone! Just take a look at the issue tracker and find something that suits your talents! The primary source of information is still the Manual and Documentation, but as a developer you might need additional information which can be found here. For example the Code Overview. As a developer, you should subscribe to the GPAW Mail List. We would also like to encourage you to join our channel for Internet Relay Chat. Now you are ready to to perfom a Developer installation and start development! When committing significant changes to the code, remember to add a note in the Release notes at the top (development version) - the version to become the next release. Details about supported Platforms and architectures. The GPAW-logo is available as an svg-file: gpaw-logo.svg. 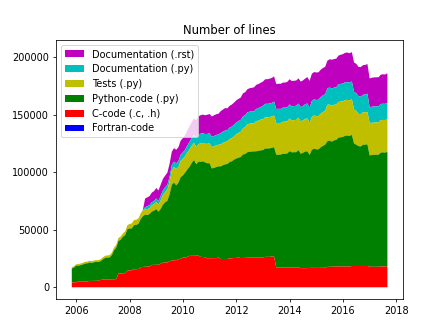 The image below shows the development in the volume of the code as per April 5 2016. Documentation refers solely the contents of this homepage. Inline documentation is included in the other line counts. Getting commit access to the GPAW code works the same way as for the ASE project.